Environment: Contact and regionally metamorphosed rocks. Locality: Tchainit and Yakutia, Russia. Link to MinDat.org Location Data. 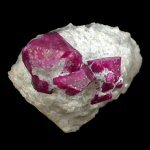 Name Origin: Probably derived from the Sanskrit, kuruvinda, meaning "ruby." Color: Blue, Red, Yellow, Brown, Gray. Luminescence: Sometimes Fluorescent, Long UV=red. Optical Data: Uniaxial (-), e=1.76, w=1.768, bire=0.0080. note: Specific Gravity of Corundum =4.01 gm/cc. U=PECorundum x rElectron Density= 6.08 barns/cc.